When receiving Dharma teachings, it is very important to bring the Mahayana motivation to mind. The motivation is to receive the teachings with the intention of attaining the ability to help all sentient beings become free from suffering and achieve lasting happiness and peace. Due to the good karma we accumulated and the aspiration prayers we made in the past, we have a precious human body, have met with spiritual friends, and can practice the Dharma. The wish to help all sentient beings achieve genuine happiness is Dharma. People in the West have a good life and enjoy material comfort and ease, but genuine peace and happiness can only be gained by maturing spiritually. All religions in the world offer this goal to their followers. The Buddha presented the Dharma for this purpose and taught in accordance with his disciples’ capabilities and needs. The 84,000 teachings that he presented show how to dispel disturbing emotions and ego-fixation that obstruct us from overcoming suffering and from attaining the goal. The teachings I am presenting are based on the treatise entitled “Distinguishing Consciousness from Wisdom” that was composed by the Third Gyalwa Karmapa, Rangjung Dorje (1284 – 1339 C.E.). In this treatise, he taught that “consciousness” is the state in which we do not realize the genuine nature of our mind and thus perceive and apprehend internal and external appearances incorrectly. “Wisdom” refers to realisation of our mind’s genuine nature after having dispelled our delusive way of apprehending inner and outer phenomena. As long as we do not differentiate consciousness from wisdom, we experience them like milk mixed with water. There are four possible views of consciousness and wisdom. They are: not understanding anything at all about this topic; understanding the two aspects wrongly; understanding the two aspects somewhat; and realising the true nature of our mind fully and perfectly. People who do not differentiate consciousness from wisdom at all go through life self-absorbed. Persons who wrongly understand the two aspects of authentic reality believe in a truly existing self that they call I” and the real existence of that which is apprehended as other than the self. There are also religious traditions that teach its followers to believe in a truly existing entity that creates everything. Other traditions teach its followers to believe that phenomena arise haphazardly, i.e., without causes and without having effects. Another wrong view is thinking that both the body that is composed of elements and the mind cease when the elements disintegrate at death. Hinayana Buddhists have a partial understanding of authentic reality. They do not believe that the world has inherent existence but they believe that smallest indivisible particles as well as the mind truly exist. The Cittamatra school of Mahayana teaches that external appearances do not truly exist but are mind only. Since Cittamatrins believe in the true existence of shortest instants of mind, they have a partial understanding of the mind’s genuine nature. The Madhyamaka proponents of Mahayana understand that external phenomena as well as the internal mind have no independent existence. They teach that our mind is free of the extremes of being existent, of being non-existent, of being neither existent nor non-existent, and of being both. Furthermore, they teach that the true nature of our mind and of all things is the inseparability of the relative and ultimate truths. Despite this fact, we call our mind “self” or “I.” Our head, hands, legs, and so forth are our references for imputing a “self.” If we search for the self that we imagine has true existence and investigate thoroughly, we will not find it. Nevertheless, we distinguish between a personal self and a self of appearances that we apperceive and imagine are other than the self. Phenomena are apparent realities that arise in dependence upon many factors and conditions. The nature of apparent realities or relative appearances is the ultimate truth or genuine reality, and the ultimate truth manifests as relative realities. We do not apprehend phenomena as the indivisibility of the two truths and to help us understand, the Third Gyalwa Karmapa presented the example of the moon’s reflection on the surface of a pool of water. The clear reflection of the moon on water is an apparent reality, but if we drain the water out of the pool, we will never find the moon. That non-finding is the ultimate reality. The appearance of the moon and its non-finding illustrate the indivisibility of the two truths. In the same way, our mind, which is free of the two extremes of existence and non-existence, is the indivisibility of the two truths, i.e., our mind is Dharmakaya, ‘the truth body of a Buddha.’ So, we appreciate and acknowledge that Madhyamaka, ‘the great middle way,’ teaches the correct view of reality. Madhyamikas understand that external phenomena lack independent existence and are but a projection of our mind. Just as the moon’s reflection can only be seen on the surface of a pool of water on a cloudless night, external and internal phenomena lack inherent existence and merely appear in dependence upon many conditions. As indicated, wisdom is realization of the inseparability of the apparent and genuine nature of appearances and experiences and failing to realize this is what consciousness means. To understand how our mind functions, eight types of consciousness are taught. They are (1) the eye consciousness; (2) the ear consciousness; (3) the nose consciousness; (4) the tongue consciousness; (5) the body consciousness; (6) the mental consciousness that identifies that which has been perceived by any of the five sense consciousnesses; (7) the afflicted mind that evaluates and judges what has been apprehended by the sixth conceptual consciousness; and (8) the ground consciousness in which the imprints of the other seven consciousnesses are stored as predispositions, capabilities, and habitual patterns. We think that the many phenomena that we perceive arise simultaneously and appear to us all at once, which is not the case. For example, if we listen to music and have a snack while reading a book, we do not perceive and aren’t aware of our mind’s various functions. Even though we have the impression and think that we perceive and apprehend more than one aspect of our mind at the same time, this is not so. Four conditions need to be present so that a perception and apprehension can take place. They are: (1) There must be the basic eighth ground consciousness; (2) there must be the faculty and consciousness of a sense organ that can perceive a respective object; (3) there must be an object that is fit to be perceived; and (4) there must be the immediate condition of the seventh consciousness that connects a perception with an apprehension. For example, an object that is fit to be seen is perceived by the visual consciousness of the eye faculty of our eye organ through the ability that we have acquired and that is stored in our ground consciousness. By means of our immediate consciousness, we connect the first and second phases to the third phase when perceiving and apprehending an object. It is impossible for cognition and conceptuality to take place if one or any condition is missing. The example can be formulated in this way: The eye faculty of our eye organ meets with a form and our visual consciousness perceives that form. Our sixth mental consciousness apperceives that form and identifies it. Then our seventh consciousness evaluates and judges what that appearance is like for us, i.e., whether it is pleasant, unpleasant, and so forth. This cognitive process is completed when it has become instilled in our ground consciousness. If we hear a sound directly after this process has been completed, a new cognitive process begins. This example shows that our consciousnesses do not occur at the same time and that there is a gap between each process. Since we apperceive objects with our sixth mental consciousness, we assume that our mind abides within our body, e.g., in our brain or in our heart. This experience does not stand in opposition to the instructions given in the Sutras. We apprehend the objects of our mental consciousness, for example, thoughts of the past, present, and future, within ourselves. Everything that we perceive and apperceive by means of our five sense consciousnesses, our mental consciousness, and our afflicted consciousness is collected in our ground consciousness, so our ground consciousness is the source of all cognitive processes. We can say that our ground consciousness is the basis of causes and effects that we are confronted with and face. While awake, we experience the imprints of the first seven consciousnesses that are stored in our ground consciousness, and while in deep sleep, we experience our ground consciousness nakedly. We dream when our sixth consciousness becomes active again and when our seventh consciousness interprets and judges the appearances that arise to us while asleep. Dream-appearances that we take to be real are imprints that are stored in our ground consciousness. So, when we dream, our ground consciousness, afflicted consciousness, and mental consciousness function. That is the description of how we experience our eight consciousnesses. Can we change that? Since they have no genuine reality, we can change and transform our consciousnesses into wisdom, which is the genuine nature of our mind. But first we need to understand what it means to be deceived. Let us take an example to describe in which manner we are deceived. Somebody lives near a dense jungle. When he returned home late one evening and before he switched on the light, he saw an object on the floor that could have been a rope, a cable, or a snake. He thought it was a snake and became very scared. He could just as well have thought that it was a rope. When he turned on the light, he was able to see that the object was a rope. Similarly, we can overcome our delusion about the true nature of outer and inner phenomena if we rely upon a spiritual teacher and realise the teachings that he shares with us. Through then realising the true nature of our mind, we will be free of delusions and in that way will have transformed our consciousnesses into wisdom. As long as we haven’t realized that our mind’s true nature is the Buddha nature, we will lead our lives based on our habits, thoughts, and judgements. When we realize the nature of our mind, we will have transformed our consciousnesses into wisdom. Why do we wish to transform our consciousnesses? Painful experiences that characterize samsara are created by our consciousnesses, and joyful experiences that characterize nirvana are created by our wisdom. Our own mind is the root of samsara and nirvana but we think that they arise due to external sources and factors. We categorize our experiences and create a split between apparent and genuine truths because we have not realized that the only difference between samsara and nirvana, suffering and happiness, and consciousness and wisdom is whether we have or have not realised and united with our mind’s true nature. Suffering arises from thoughts that are directed towards the past, present, and future. When we think about times in the past, we again feel situations that we went through and the sadness that then overcomes us is a delusion. It is impossible to alter the past, so pondering mistakes we made or misfortunes we once experienced causes us to suffer more than had already been the case and is useless. Thoughts about the future are mostly pessimistic and therefore also cause us to suffer. They tend to make us much more sorrowful than those we have about the past. We do not suffer when we focus our attention on the present moment, which is what we do when we meditate. Nothing new is created through meditation, rather, we rest in the experience of our mind’s true nature when we meditate. Various experiences arise while meditating. One experience is mental dullness, which is linked to our ground consciousness. If we continue with our practice, we will experience clarity that we are aware of when we are free of thoughts. From among the five wisdoms or pristine awarenesses that we develop by transforming our consciousnesses into wisdom, being free of dullness and habitual thoughts is the wisdom of Dharmadhatu, ‘the sphere of reality, the absolute expanse.’ The more we practice, the more readily Dharmadhatu appears to us in shorter and shorter intervals and is realized fully when we realize our mind’s true nature. Since it is the nature of all things, Dharmadhatu is all-pervasive. Therefore, if during meditation we experience the dullness of our ground consciousness, it is important to continue meditating so that our eighth consciousness is transformed into Dharmadhatu wisdom, the wisdom of the expanse of phenomena. The Kaya (‘body’) associated with this wisdom is the Dharmakaya (‘the truth body’). It is the aspect of a Buddha’s mind. As it is, we are responsible for our afflicted consciousness in that we evaluate and judge whatever appears to us. Phenomena are free of being good, bad, and so forth. For example, some people might think that the watch I am wearing is beautiful while others think it is ugly. If those imagined thoughts were the nature of this watch, then everybody would think alike. When we transform our ingrained tendency to categorize phenomena that lack categories, then we will have transformed that aspect of our seventh consciousness that is linked to our sixth consciousness into mirror-like wisdom as well as that aspect of our seventh consciousness that is linked to our eighth consciousness into the wisdom of equality. The body of a Buddha associated with this wisdom is the Sambhogakaya (‘the enjoyment body’). It is that aspect of a Buddha that manifests to Bodhisattvas who have attained a certain degree of realization. It is possible to think that nothing needs to be done after mirror-like wisdom and the wisdom of sameness have been attained. But our sixth consciousness continues apperceiving phenomena that our sense consciousnesses perceive. So, the wisdom that is achieved by transforming our mental consciousness is discriminating wisdom. It is the all-encompassing wisdom by means of which we clearly distinguish causes and effects, the relative and ultimate truths, and so forth. The body of a Buddha associated with this wisdom is the Sambhogakaya. Our five sense consciousnesses that perceive objects are referred to as “the five doors of the mind.” The wisdom that is achieved by transforming our first five consciousnesses in the list of eight is all-accomplishing wisdom. It is by means of all-accomplishing wisdom that innumerable sentient beings are helped and benefitted. The body of a Buddha associated with this wisdom is Nirmanakaya (‘emanation body’). It is that aspect of a Buddha that manifests out of compassion to help ordinary beings. The fourth Kaya is the Svabhavakaya (‘the essence body’). It is a term for the inseparability of the Dharmakaya, Sambhogakaya, and Nirmanakaya of a Buddha. We think that reaching Buddhahood is a long and tedious journey, but the seed is present within us and everyone, without exceptions. We only need to make a few changes so that we realize and manifest our innate Buddha nature. In Mahamudra, which is the main system of practice for recognizing the nature of our mind in the Kagyü tradition, this process is associated with the view, meditation, and action. The view is the understanding that our consciousnesses are deceptive, lack inherent existence, and can be transformed into wisdom. When we have transformed our ground consciousness and in that way have attained realization of all-pervasive Dharmadhatu wisdom, then we will have realized the wisdom of all our consciousnesses. To do this, we need to meditate, and to meditate correctly, we need to have gained certainty of the view. Action Mahamudra refers to the time of post-meditation. It means with our body, speech, and mind refraining from negative and harmful actions and accumulating merit in our daily activities. We accumulate merit by making prostrations and offerings, by being generous, and so forth. In Mahayana, it is said that our view should be as vast as space and our actions should be like a finely woven net that is spanned across the vast expanse of space. The fruit of having perfected the three practices of Mahamudra is transformation of our eight consciousnesses into the five wisdoms, attainment of the four Kayas, and realization of Buddhahood. This result is not empty space, rather, Buddhahood is a state of limitless qualities. We saw that as ordinary beings we are only able to apperceive one object at a time. Bodhisattvas who have reached the first ground are able to receive teachings from 100 Buddhas and can teach 100 disciples at the same time. They are able to recognize 100 past lives that they had and can know 100 future lives that they will have at the same time. All in all, twelve such qualities are instantaneously and directly present for Bodhisattvas who have reached the first ground of a Bodhisattva’s path to enlightenment. These qualities multiply by 100 for Bodhisattvas who have reached the second ground, by another 100 times for those who have reached the third ground of accomplishment, and so forth. The tenth ground is the highest, but the qualities that have been attained at this ground are small in comparison to the qualities attained at Buddhahood. The immeasurable qualities of a Buddha are not outside ourselves but are always and already present within our own mind. – Thank you ! On the website of Karma Triyana Dharmachakra in Woodstock, N.Y., it is written: “Bokar Rinpoche was born to a nomadic family in Western Tibet. He was recognized at age four by H.H. the Sixteenth Gyalwa Karmapa as the reincarnation of the previous Bokar Rinpoche. He left Tibet at the age of twenty and at that time met the great meditation master Kalu Rinpoche. Beginning in 1967, under the guidance and direction of Kalu Rinpoche, Bokar Rinpoche stayed in retreat for three years, practicing the Six Yogas of Niguma. After that, he did another three-year retreat for the Six Yogas of Naropa. He became the retreat master of the retreat center at Sonada, and later His Holiness appointed him master of the new retreat facility at Rumtek as well. Due to his remarkable qualities and deep realization, Bokar Rinpoche was considered the spiritual heir of Kalu Rinpoche and holder of the Shangpa Kagyu Lineage. “In June of 1996, Bokar Rinpoche offered a retreat in the United States on the complete meditative stages in the great Mahamudra tradition of the Karma Kagyu Lineage. In response to his experiences with Western students, he formulated this retreat and an accompanying program of meditation practice to meet the needs of sincere lay practitioners of Buddhism. It allowed lay Westerners to remain involved with family and community while nourishing Dharma practice by committing an hour a day or more to formal practice. Rinpoche said, ‘Our approach with the seminar, at the very beginning, was to emphasize not rejecting work, family, and so forth, but to integrate a daily practice into one's lifestyle.’ Through this program, hundreds of students worldwide have received Dharma instruction in English, French, Tibetan, and Chinese in annual seminars in India, France, and North America. “Bokar Rinpoche founded a retreat center in Mirik, India, and then, at the urging of the local community, a monastery. Both continue to thrive (…). He was also known for holding the Kalachakra Lineage, which he had received from Kalu Rinpoche along with the entire Shangpa Kagyu transmission. Through this goodness, may omniscience be attained. Thereby may every mental defilement be overcome. May beings be liberated from the ocean of samsara, which is troubled by waves of birth, ageing, sickness, and death. Assemblies of the ocean of Victorious Ones, the Three Jewels and Three Roots, from the depths of the realms free from obscuration, by the power of your unobstructed awareness, and for the glory of the teachings and all beings, pray heed the wishes of this yogi‘s one-pointed, woeful supplication! The heart-essence of the teachings is the Tripitaka and the four classes of Tantra, the treasure-like ocean where all the streams of the profound transmissions convene is the Lord Marpa‘s Lineage of the profound oral instructions. Hosts of Yidams and Dharma Protectors of this and the glorious Shangpa Kagyu Line, I beg your attention! In the path of individual liberation, the first round of teachings by the Supreme Sage, you are the principal luminary among the holders of the unequaled Lineage of Gampopa. Your ethical discipline is utterly pure like the fragrance from a grove of medicinal herbs. Karma Ngedön Chökyi Lodrö, please swiftly return! The heart essence of the higher turning of the Wheel is Bodhicitta. What‘s realized is profound peace, free from elaborations. In the noble path that subdues and pacifies, through your mindfulness and vigilance you have demonstrated the means of liberation. The transmissions‘ myriad and profound oral instructions are the essence of the Final Turning. In these you were nurtured by Gyalwang Rangjung Rigpai Dorje, the glorious Rangjung Kunkyab and others. Karma Ngedon Chokyi Lodro, please swiftly return! To the embodiment of the enlightened activity of the Victors of the three times, Karmapa Orgyen Trinley Dorje Tsäl, and to hosts of other eminent masters, you are the treasure of the oral instructions and explanations of the Lineage. Precious One who wields the victory banner of the accomplishment of the teachings of the Victor, in general, and the precious practice lineages, in particular, supreme spiritual friend who nurtures his disciples as he would his only child, may the unmistaken rebirth of your Nirmanakaya swiftly return! By the truth of the power of my pure samaya and genuine intent, by force of the faith of your students who abide in all the reaches of this world, by the power of the unfailing truth of the never changing Dharmata, for the benefit of the teachings and beings, may these wishes be perfectly fulfilled! - On August 17, 2004 upon hearing that the holder of the doctrine, the precious being, Bokar Rinpoche, Karma Ngedon Chokyi Lodro‘s mind had suddenly passed into the Dharmadhatu, my mind was moved by such an authentic being‘s activity, my heart was profoundly struck by the great affection he showed to me and by our sacred connection. Self-arising, undivided, everlasting Dharmakaya, truth body springing up as wondrous form, the Rupakaya; may the triple secret of the Karmapa rest stable in the Vajra realm, activity endless and spontaneous with glory. Gyatso, Chenresig in person. May his life be secure for hundreds of kalpas. The photo of H.H. 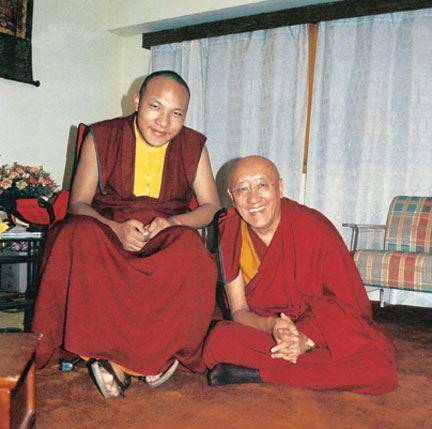 Gyalwa Karmapa, Ogyen Trinley Dorje, and Venerable Bokar Rinpoche is courtesy of Changchub Gyaltsen (photographer unknown). 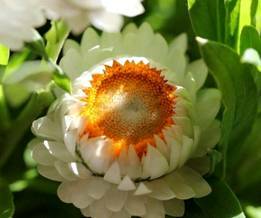 The photo of the beautiful flower was taken and offered by Lena Fong. / Based on the manuscript that is in German, these teachings were translated and edited by Gaby Hollmann, responsible for any inadequacies. This text is for personal studies only; it may not be downloaded & posted or published anywhere else & it may not be translated into another language to be published or posted in that way. All rights reserved. Copyright, Munich 2013. – May virtue increase!